"What protein bar do you recommend?" This is always a tricky question to answer because I have yet to find a store-bought bar that I would wholeheartedly endorse. All too often you have to make a big nutritional compromise when choosing a protein bar. I generally put store-bought protein bars into the category of "mock health foods". Sure they sound healthy, but they are really not that healthy or helpful for your goals. This is not intended to bash protein bar manufactures. Today's bars range from horrible to quite good. However, here are some common problems you will often run into with store-bought protein bars and things to watch for when reading ingredients. Traditionally many protein bars were made with large amounts of sugar. While this made tasty bars, it obviously was not helpful for your health, performance or waistline. This is still common in many of today's "energy bars". Back in the low-carb craze of the late 90's and early 2000's, people demanded low-sugar bars. Many companies complied by replacing sugars with alcohol sugars which do not impact on your blood sugar levels. These brought down the "net carbs" of the bar, but raise questions from a health perspective. Also, alcohol sugars can have a laxative effect and result in an unplanned sprint to the washroom (not the kind of inconvenience you want for many of life's situations). Another common sugar substitute is dried fruits (e.g. dates). While these are great in a post-training meal, they are still high sugar and should otherwise be avoided. More recently many companies have used what seems to be a natural, healthy sweetener - agave nectar. This syrup-like substance is extremely sweet and minimally impacts your body's insulin response which sounds good. However, the reason for these "benefits" is that it is loaded with fructose. While eating some fructose in whole, fresh fruit is great, you do not want to consume high amounts of concentrated fructose as it can lead to obesity and other health problems. From a business standpoint, manufacturers are always looking to bring costs down. One simple way to do this is to replace at least some of your high quality protein (e.g. whey) with a low-quality protein (e.g. soy - click HERE for more info on soy). One of my fundamental nutrition philosophies is to eat natural. As a result, I'm not a fan of most protein bars. I have had bars that have the same look, taste and texture as a regular chocolate bar. Healthy eating goes far beyond just having high protein content and a lot net carbs. Many bars are missing natural ingredients. Also, depending on where the bar is manufactured and how tight quality control is, you could end up with a bar that contains a lot more sugar than what is on the label because they flat-out lied about the nutritional content. While there are some bars that seem very "natural", they are often nutritionally incomplete - especially from a high-performance nutrition perspective. For example, the bar might be just dried fruits and nuts. While this is hopefully more rare, you may still see this. Always avoid hydrogenated fat. For those on a tight budget, the cost of protein bars can add up quick. While protein bars are one option in emergencies, they should not be a regular menu item. Years ago I had a client who was eating 3 protein bars a day. If you find yourself regularly turning to protein bars to get your daily nutritional requirements, then you need to look at improving your planning and organization. If your training goals are important to you, then you need to carve out time in your busy schedule to shop, cook, meal prep and unfortunately - wash dishes. For more information on meal prep, click HERE. Next to meal prep, power-shakes have replaced any need for a protein bar in my diet. When I'm busy, I'll pre-blend the shake ahead of time and can slam it back while training athletes or between teaching classes. Power shakes are not only faster and cheaper than protein bars to consume, but if you make them like I do, they can actually be a huge nutritional benefit. For more information on power shakes, click HERE. For times when you cannot bring a pre-blended shake with you (e.g. airline travel) or to have on hand for unplanned schedule changes which could result in missing a meal, try my emergency nutrition plan. It is a cheaper, healthier option than most protein bars. See week 38's tip in this series on developing an Emergency Nutrition Plan HERE. If you know you have travel or some other event coming up that would prevent you from drinking a power shake or you simply prefer chewing your food instead of drinking it, another option is to make your own protein bars. This puts you in total control over exactly what goes into the bar. A great book for homemade bar recipes (as well as just a great Performance Nutrition cookbook in general) is Precision Nutrition's Gourmet Nutrition cook book. Also, to get you started on homemade protein bars, here is a simple recipe from T-Nation editor Chris Shugart. 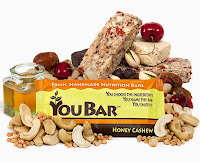 A few years back, I was introduced to a cool company called YouBar which actually lets you build your own protein bar. You can go to their website, create your own customized bar based on your nutritional needs and taste preferences and they will make it, put your name on the wrapper and ship it to you. Click HERE to check out YouBar (note: this is not an affiliate link). Pick one idea from the above section and implement that into your nutrition this week. This may not be using protein bars but simply stepping-up your meal planning. If you do want to go the protein bar route, now you have some good options. Take a look at USANA protein bars. They are high quality and taste good for a protein bar. Here is a link to them. What about Greek yogurt with some honey, string cheese, or almonds? I feel all are just as easy to grab and go like a protein bar, and ingredients are easier to manage. Good suggestion Aaron. I personally can't do dairy, but it is another option for those who can.